Fall brings a veritable cornucopia of wild berries to the hedgerows that fringe the lanes and footpaths near my home. Chief among these is the tongue-staining blackberry, whose generous fruits are teamed with apples from the community orchard to make a classic crumble. A hand-picked, home-made crumble such as this is the ultimate comfort food – a seasonal treat that marks the start of those long, cozy nights in front of the fire, when planning for the next growing season begins in earnest. With the last of the summer crops cleared, the proverbial dust has settled and the garden now ticks over quietly with its fill of winter staples. It’s not all rest and reflection, however, because late autumn is the perfect time to plant new fruit trees, bushes and canes. At this time of year the soil still carries considerable warmth from the growing season, allowing plants to bed in before the onslaught of winter and get off to a flying start in spring. One group of fruits I’m planning to make space for is the hybrid berries. Hybrid berries are crosses between common cane fruits, usually the ever-dependable blackberry and raspberry, to give completely new berry types. You may have heard of some: the loganberry and jostaberry, for example. Others, like the veitchberry, may be less familiar. A few hybrid berries are even crosses of crosses – the boysenberry for instance, is a cross between a loganberry and a blackberry. 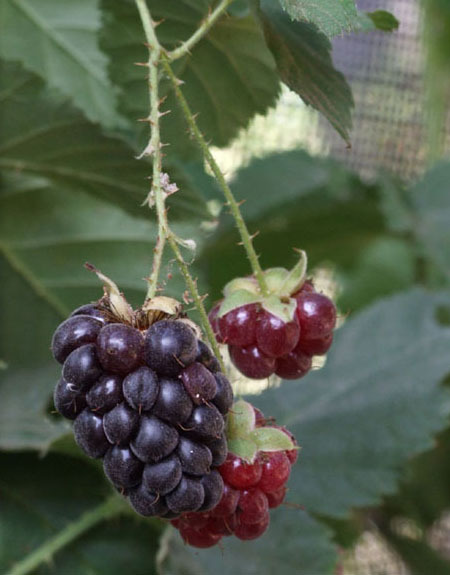 The youngberry, named after Byrnes M Young, the Louisiana businessman who successfully created the new hybrid, is a cross between a blackberry-raspberry hybrid and a dewberry, which is a species in its own right. If all this is getting a little complicated, it really shouldn’t; the key point to take away is simply that all of these hybrid berries taste great! Bred to give a range of berry sizes, colors and levels of sweetness, all of these variants can be used in exactly the same way as the common-or-garden blackberry: in desserts (including crumbles! ), as a centerpiece to a quirky jam or as the basis to a fruity sauce. Modern breeding continues to develop new or improved hybrids with qualities such as spine-free stems or more compact, tame-able canes. Any specialist fruit grower should have a good selection of hybrid berries available to buy. Study their descriptions closely and decide which are for you. Given well-prepared ground (with plenty of well-rotted compost, manure or sieved leafmold added to it) and a sunny position, plants should crop for a number of years yielding anywhere between 5-10kg (11-22lbs) of fruit per plant. Here are a few of the most common hybrids you are likely to come across. Loganberry: A good choice for cooking thanks to its fairly sharp, though rich-tasting fruits, which hold their shape. This raspberry-blackberry cross originates from sunny California. Thornless varieties are available. Boysenberry: The distinctive taste of wild blackberries in a plant that’s far better behaved! The thornless canes yield large, deep purple fruits. The boysenberry is a cross between a loganberry and a blackberry. Tayberry: Enjoy the best qualities of raspberries married to the best of blackberries. The elongated, red-purple berries have a sweet flavor. Bred in Scotland 50 years ago, the tayberry quickly established itself as one of the finest hybrid berries. Tummelberry: This hybrid has a similar flavor to the loganberry, though it’s a Scottish-bred variant of the tayberry. Tummelberries offer one of the longest picking windows of any of the hybrids and, to its fans, the best flavor. Hybrid berries are easier to pick and tend when trained against horizontal supports. Stretch heavy-duty galvanized wire along fences or secure to free-standing posts. The bottom wire should be about 60cm (2ft) off the ground, with each subsequent wire spaced 30cm (1ft) to leave the top wire 180cm (6ft) above ground. The berries are produced on last season’s growth. Once these canes have fruited they are simply cut right down to ground level, allowing the new season’s growth to overwinter and produce next year’s harvest. This makes training the canes exceptionally easy. Tie in the current season’s fruiting canes to one side and any new growth – which will bear next year’s berries – to the other. In this way the fruiting canes alternate sides from one year to the next. There’s no room for confusion and everything’s in its logical place. Aside from training other routine tasks include netting fruiting canes against birds and applying a springtime mulch of well-rotted manure or compost, taking care not to let it touch the canes. You may need to water in dry weather. Clearly hybrid berries offer a lot of variety and the chance to shake up the fruit garden. Have you grown any of these hybrid berries? Let me know which are your favorites by dropping me a comment below – you can help me to narrow down my shortlist! "Thanks for the article - very informative. Can you tell me how to tell the difference between loganberry, and boysenberry plants? I have both in my garden, and like to dig up new shoots where I don't want them, pot them and give to friends, or sell them. But I am finding it hard to tell the difference when the plants are young. Also I have had gooseberry plants, and jostaberry in my garden for some years but almost no fruit - a small handful of gooseberries this year for the first time, but never any jostaberry flowers or fruit. They are near the raspberries, which do very well. Any suggestions? Do they like more acidic or alkaline soil, and morning or afternoon sun? They get a fair bit of afternoon sun at present. Thanks, Debbie "